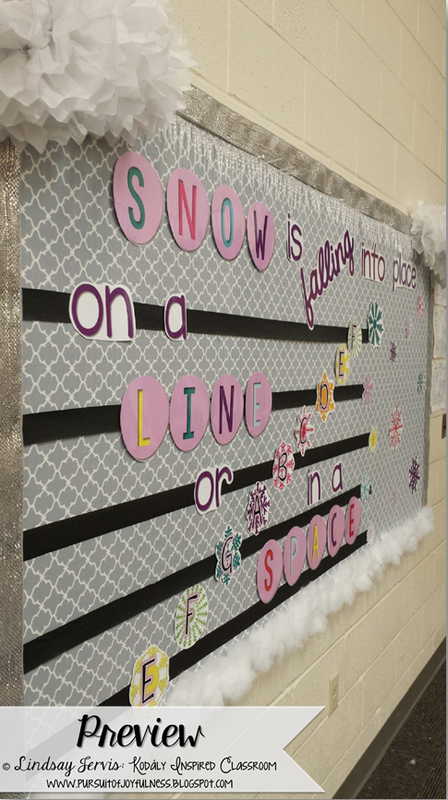 This week we got a about 3 inches of snow here in Wichita, and so I thought it was probably time I trade out my sailboat themed bulletin boards for something else. 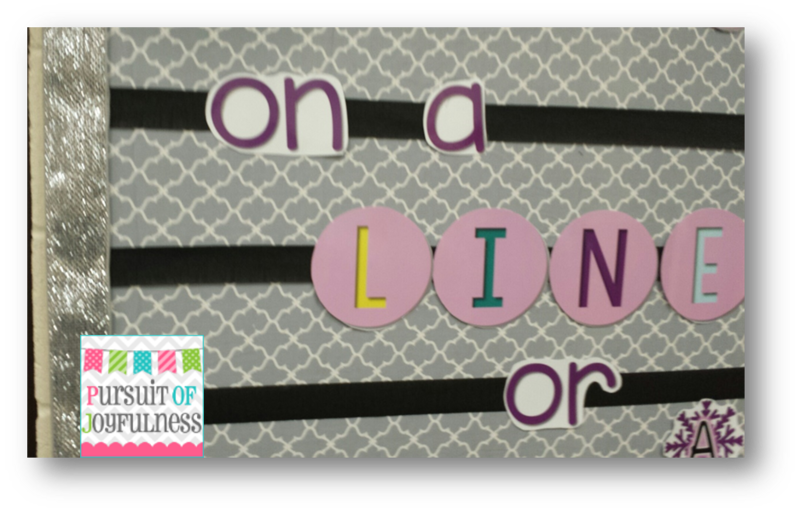 I love to have a line/spaces bulletin board up in my room for my students to refer to, especially when we work on recorders and Orff instruments. 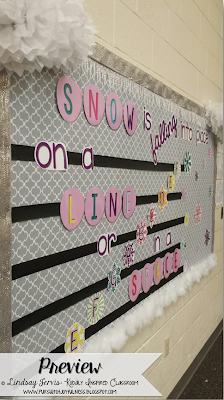 So I came up with "Snow is falling into place, on a line or in a space". I envisioned snowflakes falling to the ground with the letter names in them. I went to Hobby Lobby and Target to pick up some extras for my board. I got a 60 ft. roll of silver Christmas ribbon 50% off at Hobby Lobby along with the adorable gray fabric I used for the background. This is my first fabric backed bulletin board, and I LOVE it. A little more expensive, but I can use it again and again and not have to re-cut it. I love this pattern and think it is really pretty and calming. I also picked up an icicle garland that I ended up using along the top. I also purchased pre-made Poms for the corners. Each pom is actually half a pom. I cut them in half, and stapled where I cut. At Target, I grabbed a bag of "glitter snow blanket" to be the bottom border. I created all of the text and snowflake letters on the computer, printed, laminated and cut out. I loved the different fonts that I got to use by doing this and that the colors were an exact color match to the snowflake clip art I used. For the side and top border, I had to triple layer the ribbon. 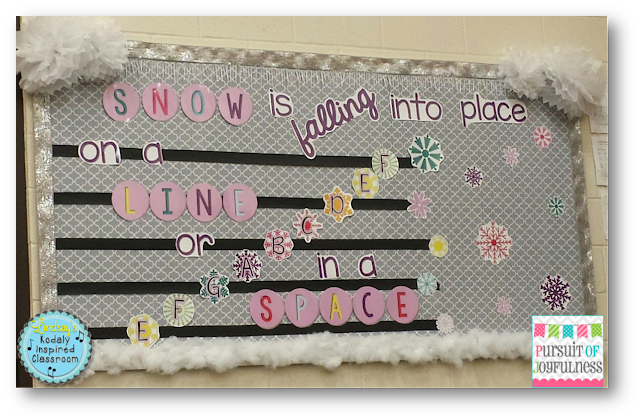 I love the way it looks though as opposed to the traditional bulletin board border. The lines of the staff are party streamers. I bought one roll several years ago and have gotten many, many boards out of it for only $0.99 or so! I use tape first to make sure the spacing is good before I staple them down, and I use some of the text to cover staples. I am still trying to decide what to do on my other two bulletin boards. For now, they are still sporting sail boats. Let me know if you have a brilliant snow themed idea for my other boards below! 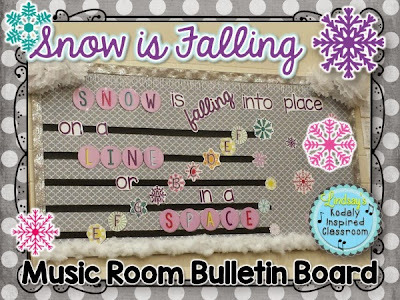 I have your snow staff bulletin board hanging in my room right now. I would love to use the same idea but switch it up for Valentine's Day. Any chance you'd be willing to create some new visuals? Hope I can get to that project this school year!